The Epson Home Cinema 5040UB ($2,699) and the Optoma UHD65 ($2,499) are two very unique and outstanding home theater projectors that offer 4K and HDR support as well as stunning image quality with rich color and excellent contrast. However, beyond that they are entirely different beasts with different feature sets. For example, only the HC 5040UB supports Full 3D. On the other hand, though both offer frame interpolation, only the UHD65 will let you use it with 4K input or upscaling from 1080p. The best choice for you comes down to which features are most important to you. 4K DLP chip vs. Epson 4K-Enhancement. Many of the differences between these two projectors stem from the imaging technology each uses. The UHD65 delivers a true 3840x2160 pixels thanks to its 4K UHD DLP chip. The HC 5040UB puts fewer pixels onscreen with its three 1080p LCD chips and Epson's pixel-shifting 4K Enhancement technology. However, it generates a lot more pixels than standard 1080p projectors. To the human eye, its level of resolution is high enough to be virtually indistinguishable from 3840x2160 for photorealistic images. The difference can be more obvious with text or graphics, but that's not what either of these projectors is meant for. Lens. Because the 4K-Enhancement technology is less expensive than a 4K DLP chip, Epson can pack some costly features into the HC 5040UB and still sell it for about the same price as the UHD65. High on the list is an all glass, 16-piece, 2.1x zoom lens. Based on our observation that the HC 5040UB actually shows finer detail, the lens appears to offer better optical quality than the UHD65's perfectly capable but unexceptional 1.6x zoom lens. Extensive vs. Modest Lens shift. The HC 5040UB offers horizontal and vertical lens shifts. As with many Epson models, both shifts have about as large a range as you can find on a home theater projector. The UHD65 has some vertical shift but with a much smaller range. It also lacks keystone correction. The combination gives it far less flexibility than the HC 5040UB for positioning the projector. Manual vs. Motorized Lenses.The HC 5040UB offers powered focus, zoom, and lens shift compared with manual controls for the UHD65. It also offers a Lens Memory feature for storing up to 10 combinations of lens position. This is a major advantage if you want a Constant Image Height setup without the cost or bother of using an anamorphic lens. To switch between settings for 2.4 format, 16:9 format, and any other aspect ratio, simply chose the stored settings from memory. 3D Video. The HC 5040UB offers Full 3D support, although it is limited to 1080p and RF glasses. The version of the UHD65 we tested does not support 3D at all. A promised firmware upgrade (expected by November 2017) will add 3D, but only for PCs at 30Hz 1080p. Upscaling. The UHD65 upscales all input to 2160p and lets you use all of its image processing options with any input. The HC 5040UB automatically turns on its 4K-Enhancement for 2160p input, but gives you a menu option for using it or not with 1080p signals. When 4K Enhancement is on, you can't use the 5040UB's frame interpolation feature. 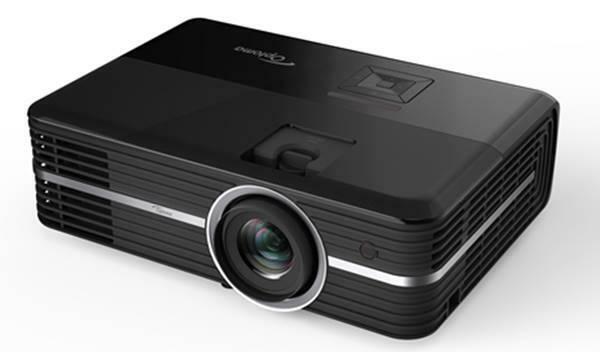 Relative picture quality for these two projectors varies depending on whether the input signal is 4K with High Dynamic Range (HDR), 4K with Standard Dynamic Range (SDR), or 1080p with SDR. Image Sharpness. With all three types of input, there's a small difference in image sharpness in the HC 5040UB's favor. However, the details and impact on overall quality vary from most important at 1080p to least important at 4K with HDR. Based on specs, the UHD65 has a higher resolution than the HC 5040UB. Its DLP chip delivers a full 3840x2160, or 8.3 million, pixels on screen. The HC 5040UB's pixel shifting with 1080p chips delivers a pixel count well short of that, despite looking similar to the human eye. That said, there's a difference between resolution specs and the ability to resolve detail. The HC 5040UB resolves detail better largely due to its higher quality lens, though its video processing (Super Resolution and Detail Enhancement) may play a part as well. The incremental advantage is primarily in details so fine that you probably wouldn't notice them if you weren't looking for them. With 4K input, fine detail is a little more obvious than with the UHD65. With a 1080p signal, details you can barely see on the UHD65 are clearer on the HC 5040UB. In the end, the 5040UB's edge in video detail resolution isn't much, but simply being able to match the UHD65 would be an accomplishment in itself. Doing a little better is remarkable. For 4K and 1080p input with SDR, it helps give the HC 5040UB an ever-so-slight edge overall--as long as you don't count its limitations for FI. For 4K with HDR, however, other factors matter more. 4K + HDR: The UHD65 is the strongest of the two for 4K HDR. Straight out of the box, it delivers a highly watchable 4K HDR picture. With default settings for both models, the UHD65 is much brighter than the HC 5040UB, and shadow detail separation is far better. More important, if you make any changes, they are saved to the color mode the UHD65 automatically switches to when it detects HDR input. Another advantage for the UHD65 is that you have full use of all of its video processing features, including frame interpolation. The HC 5040UB won't let you use either its FI or Noise Reduction features with any 4K input--with or without HDR. If top quality HDR is at the top of your priority list, in short, the UHD65 beats the HC 5040UB hands down. SDR: The HC 5040UB performs better than the UHD65 with SDR video in either 4K or 1080p. Its image is a touch sharper; its color is equally saturated, bright, and eye catching; and it delivers darker blacks. Comparing images side by side using default settings for the color preset modes, the UHD65's mode with the darkest black is still not as dark as the HC 5040UB's mode with the least dark black. Without something to compare to, the default settings for both projectors in most color modes are good enough to use right out of the box. The only exception is the UHD65's brightest mode, which is too green to ignore. The UHD65's other modes have a green bias as well, but little enough that many people won't notice it. Much the same is true for the HC 5040UB, although the default settings offer closer to neutral color, as is immediately clear in a side-by-side comparison. More important is that both have ample menu options for adjusting color, although I found the UHD65 menus a little easier to work with. For SDR input, in short, the UHD65 and HC 5040UB are very much on equal footing for image quality, despite each doing a few things better than the other. The HC 5040UB offers darker blacks, ever so slightly better sharpness, and slightly more accurate color with factory settings. The UHD65 lets you use all of its video processing features, most notably FI, with 4K input and upscaling to 4K, and I, at least, found its menu logic easier for adjusting color. Brightness. Brightness comparisons between DLP and LCD projectors can often be misleading, because you have to make allowance for DLP's Brilliant Color feature which is frequently used to boost white brightness over color brightness. This is not true on the UHD65. Brilliant Color is a menu choice, with settings from 1 (off) to 10 (highest), and the default for most color preset modes is 10. However, it is programmed to give nearly matching white and color brightness at the highest setting in all but one of the color preset modes. The exception is Bright mode, which has a color brightness of only about 75% of white. For all the other color modes, the default settings deliver color that is over 90% of the white brightness, which makes color images essentially as bright as you would expect from an LCD-based model with the same white brightness. This makes our measurements of ANSI Lumens close to the color brightness for both models, and suitable for judging their comparative brightness for home theater use. All measurements for both were taken with the zoom lens at its widest angle setting. The HC 5040UB is one of several models we've seen recently from Epson that measure way over spec. Epson rates it at 2500 lumens. We measured it in its brightest mode at 3527 lumens. Bright Cinema, with its better color fidelity, came in close to the rating, at 2401 lumens. Note that the factory default settings for lamp power vary from one color mode to the next. Bright Cinema, for example, is set to Medium power by default. However, you can set any color mode to any power level. ANSI Lumens for High, Medium, and Eco are as follows. Optoma rates the UHD65 at 2200 lumens. We measured it at 1717 ANSI lumens in its brightest mode and at 2217 lumens based on the center spot only. The ANSI lumens measurement is usually lower because it averages readings at nine points rather than just the center spot. So it takes brightness variations across the screen into account. The UHD65 has two lamp settings -- Bright and Eco. It also has a Dynamic Black setting that adjusts brightness based on the contents of the current image, much like an auto iris. The feature is on by default, and you can't switch to Eco power mode unless you turn it off. It also lowers the brightness in Bright power mode by 1% to 2%. The following results for ANSI lumens are with Dynamic Black Off. Eco modes. The HC 5040UB offers two reduced power modes: Medium, which lowers brightness by 23%, and Eco, which lowers it by another 2%, or 25% in comparison to High mode. The UHD65's Eco mode lowers brightness by 31% compared to its Bright mode. Zoom lens light loss. As with most zoom lenses, the lenses for both the HC 5040UB and the UHD65 curtail light at the telephoto end of their range, compared with the wide angle position. For the HC 5040UB's 2.1x lens, the measured brightness loss is 33% at the telephoto end. For the UHD65's 1.6x lens, the loss is 27%. In both cases, the loss is enough that you'll need to take it into account when positioning the projector. For maximum brightness, you'll want it as close to the screen as possible with the lens set to the wide-angle end of the zoom range. Brightness uniformity. The HC 5040UB's measured 93% brightness uniformity is excellent and as good as it gets in digital projection. On the other hand, the UHD65 delivered 59% uniformity, which is poor for a home theater projector and easy to see on a solid white or light color image. Fortunately, most video images break up the field of view and mask flaws in uniformity. Since you don't know how bright one portion of a picture is supposed to be relative to another, the image appears to be uniform on the screen. Rainbow artifacts. The HC 5040UB's three-chip design does not produce rainbow artifacts. All single chip projectors like the UHD65 rely upon rapid sequential updating of color information, so they are all potentially capable of producing rainbow artifacts. Overall, they will be noticed on occasion on the UHD65, but they appear infrequently enough that few people, if any, should find them bothersome. Onboard audio. The HC 5040UB doesn't have onboard speakers, which makes an external sound system mandatory. In a home theater, of course, you'll want to use a high quality sound system with either projector. However, the UHD65 has excellent onboard stereo audio for a projector, with two built-in 4-watt speakers, each in its own enclosure on the back panel. That can be useful if you want to set it up in the backyard for a movie night or the like. Input lag. We measured the input lag for the HC 5040UB at 28 ms with 4K Enhancement on, which doesn't allow FI. With 4K Enhancement off, we measured it at 29 ms with FI off, 68 ms with FI Low, and 104 ms with FI at Normal and High. The UHD65 come in at 74 ms with FI off and 141 ms with it on at any level. All measurements were made with a 1080p input signal. Fan Noise. Epson rates the HC 5040UB's High mode at 31 db, which is easily enough to notice during quiet moments for anyone sitting near the projector. Both Medium and Eco lower the noise to the point where it is hard to hear in a quiet room. Epson rates Eco mode at 20 dB, and Medium isn't noticeably higher. Optoma rates the UHD65 at 28 dB in Bright mode and 25 dB in Eco mode, which is consistent with the observation that both modes are quieter than the HC 5040UB's High mode, but not as quiet as the Epson projector's Medium and Eco modes. In either mode, the sound will be noticeable in quiet moments if you're near the projector, but not if you're more than a few feet away. The Optoma UHD65 and Epson Home Cinema 5040UB are both exceptional values for the feature sets that they deliver. They both have superb image quality for projectors priced in the mid-$2,000 range thanks to their 4K capabilities, suitably dark blacks, and rich, vibrant color. However, because they are so different, you need to pick between them based on which feature sets they offer. The Epson HC 5040UB has many features that the UHD65 lacks, most notably horizontal lens shift; a much larger range for vertical shift; keystone correction; a somewhat greater zoom range; and powered zoom, focus and lens shift. So the HC 5040UB has significantly more flexibility than the UHD65 for positioning for setup, as well as the convenience of powered controls. In addition, you can store combinations of all three lens settings in memory, letting you retrieve each set with a single command, which will be of particular interest for a Constant Image Height setup without an anamorphic lens. For 3D fans, the 5040UB has full HD 3D. And it offers darker blacks and just a touch better sharpness. The Optoma UHD65 has the key strategic advantage of excelling at 4K HDR. Even with its default settings, it delivers more-than-acceptable picture quality with HDR, and any tweaks you make to improve it get saved and automatically loaded every time it detects HDR input. Neither is true for the HC 5040UB. The UHD65 also features a beautiful frame interpolation system that works extremely well with both 1080p and, notably, 4K input-something the 5040Ub cannot do. The bottom line is that these two projectors stand toe to toe for overall image quality, with each having an edge in certain characteristics over the other. Choosing between them depends entirely on which features you care most about. One thing to keep in mind with LCD projectors as opposed to DLP, LCD projector have air filtering system which need to have the filter changed regularly. If dust does get on the panels it creates a nightmare of blurry globs that are incredible distracting and you typically have to have the unit serviced by the manufacturer to get rid of it! DLP have sealed light paths so little chance of dust getting in the way of your image. Unless you are sensitive to RBE - DLP is easier to own in the long run. Fantastic. I have been really looking forward to you publishing this. 3D is a must have for me - I love it, and the lack of it on the Optoma was a deal breaker. Does the upcoming firmware update mean that the 3D source has to be a PC then? Not a games console or a dedicated UHD player? Love your website !! Interesting conclusion, considering Epson is 2 times brighter. I was expecting more from Optoma, became a fan of DLP last year. I'd like to hear a little more about LCD projectors dust susceptibility these days. I've been a DLP guy for years and have nearly forgotten about all the dust issues I had with LCD pjs. I even went as far as to put my old Epson pj into a HEPA-filtered box, which of course required two 120 mm fans to exhaust the heat. Dust blobs were (are) the worst. Excellent review and great to see a head to head comparison of these two projectors. Some what surprised that the difference in black level, though mentioned, wasn't given more emphasis. The Optima has been regularly trashed for sub-par blacks, even by DLP standards. The 5040UB is no JVC, but on dark scenes I would still expect the Optima to be seriously inferior in direct comparison. Maybe not such a drastic difference after all? Can you explain why you say the 5040ub has a sharper image in 4k than the uhd65 but not in Hdr 4k. And how does Hdr change the actual sharpness of a image?. Daniel ... I think you might have misread something, and I'm not sure what. The piece says the opposite. Specifically, it says, "With all three types of input [4K HDR, 4K SDR, and 1080p SDR] there's a small difference in image sharpness in the HC 5040UB's favor." It then goes on to talk about the difference being more subtle at 4K than 1080p, and having the least impact with HDR. But it's not that the HC 5040UB isn't sharper with HDR, it's that there's so much difference in issues like retention of shadow detail and brightness of the overall image that the minor difference in detail doesn't count for much. Thanks for the review! I love my UHD65, the 4K HDR picture Is awesome! I gave up 3D a long time ago so 4K over 3D Is a no brainer for me. Thanks for relaying in this reply and this post how important ALL factors are in choosing a projector. Image processing, lens quality, and source material are bigger factors than just pure resolution hence why I'm sticking with the 5040ub I bought on sale last weekend. Great article David! Great Review! I didn't see anything mentioning motion though. I can't stand choppy motion or overly smoothed motion. From what I gather the Optoma handles motion better, especially in 4k. Is that correct?